Arrive in Dublin and connect with your onward Aer Lingus flight to Bordeaux. 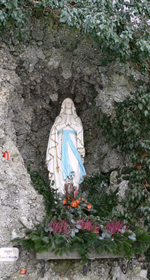 On arrival, you will be met by your guide and take a coach to the 4 Hotel Astrid in Lourdes. Check-in for 5 nights with dinner, breakfast and lunch. 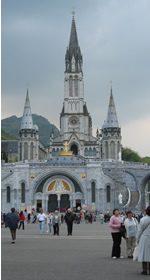 Lourdes where Our Blessed Lady appeared to little Bernadette Soubirous 18 times in 1858. In the evening your guide will give an orientation talk at the Sanctuary and take you to visit the Grotto of Massabielle. After breakfast you leave for a morning Mass in the Lower Dolors. After Mass you will have an orientation tour of the Sanctuary area. You will have the opportunity to drink from the spring near the Grotto. The original spring that Bernadette located is still visible, protected by a glass cover and illuminated by a light. Group photo or attend the 9.30am International Mass in the Basilica of St Pius X. After Lunch we take a walking tour to the Boly Mill, where Bernadette was born, and to the Cachot, an abandoned prison where Bernadettes family lived. Dinner in your hotel. After Dinner participate in the evening torchlight procession. As early as 18th February 1858, the day of the third Apparition, one of the two people accompanying Bernadette had carried a candle. After this, Bernadette herself always came with a candle. 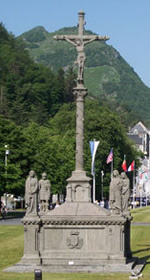 The iconic Lourdes Torchlight Procession, known throughout the world, was introduced in Lourdes in 1863 by Father Marie-Antoine, a Capuchin also known as the Saint of Toulouse. The Marian Procession is the most popular celebration in Lourdes. During the Procession, and depending on the day, the pilgrims recite the Joyful, Luminous, Sorrowful or Glorious Mysteries of the Rosary. At the beginning of each decade, a few words in several languages give direction to the prayer so that it does not become a monotonous repetition. The Ave Maria and other hymns can be heard in many languages. In the serenity of the evening, each pilgrim carries his or her own personal intentions as the prayer gathers the assembly of all nations, people and languages with the Virgin Mary, like the disciples in the Cenacle after the Ascension of Christ. The procession always takes place regardless of the weather. After breakfast you can attend the 9:45am English Mass at the Grotto. Following Mass your guide will take you to the Low Stations of the Cross. In the Afternoon you can avail of an optional tour to Gavarnie (payable localy) or spend the afternoon in Lourdes at your on leisure. After Dinner participate in the evening torchlight procession. Morning free to visit to the Baths of Lourdes, a focal point of the sanctuary, filled with the healing spring water of Lourdes. Immerse yourself in the baths where hundreds of miraculous healings have taken place. Go and drink at the spring and wash yourself there! these words of the Virgin Mary to Bernadette during one of the Apparitions inspired the creation of the Baths near the Grotto in which the pilgrims are immersed. Lunch at the Hotel. After lunch there will be an optional visit to Bartres for Mass. After Dinner participate in the evening torchlight procession. After breakfast participate in the high Stations of the Cross. Return to Hotel for lunch. Afternoon Mass in the City of the Poor. After dinner participate in the evening torchlight procession. After breakfast you leave the hotel for 9.30am Mass in the lower Dolors. Enjoy some free time around the sanctuary before we take our transfer to Toulouse airport for our return Aer Lingus flight back to Dublin. Check-in at 2.00pm for a departure of 4.00pm, arriving back in Dublin at 5.15pm. On Arrival in Dublin, check-in to the Airport Clayton hotel. Evening free in Dublin. After breakfast in the hotel you will take a panoramic city sightseeing tour of Dublin including : OConnell Street, Trinity College, Dail Eireann, St. Stephens Green, Dublin Castle, St. Patricks and Christchurch Cathedrals, Guinness Brewery, and the Phoenix Park. After you will celebrate your Final Mass of your Pilgrimage before being transfered to Dublin airport for return Aer Lingus flight to Orlando departing at 4pm arriving in Orlando at 8.50pm.